When we were new to opera we used to get Rossini's Il Barbiere di Siviglia mixed up with Mozart's Nozze di Figaro. The characters were the same, all derived from the plays of Pierre Beaumarchais; so why were the vocal ranges sometimes different? Why didn't one composer write the entire story in one opera, or even a trilogy? Last night, in the farthest reaches of Brooklyn, we experienced a pastiche that came very close to achieving such a perfect union. 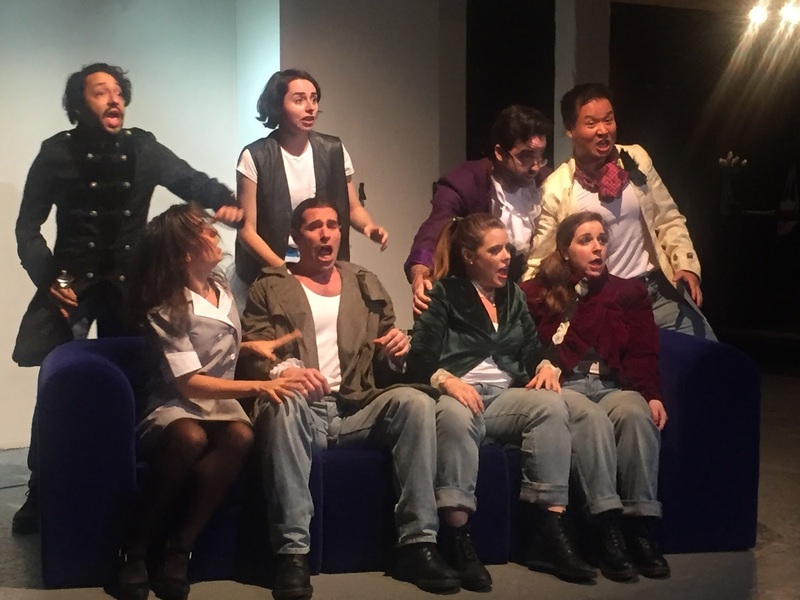 The boutique opera company known as Bare Opera is never bare of imagination, creativity, and an adventuresome spirit. For this production, Executive Producer Kirsten Scott (herself a superlative singer) assembled a fine production team and cast which brought Beaumarchais' characters to vivid life. Director Cecilia Ligorio put a modern feminist spin on the work; the women join forces to deal with restrictive guardians and cheating husbands. Scenes from Il Barbiere are interpolated within Nozze di Figaro to give insight into the origins of the characters. Most of the important arias and ensembles are preserved with tedious recitativi deleted. The entire work came in at a swift two hours. Extraneous characters are also deleted with singers assuming more than one role. The key to making this work was the high quality of the musical values, not to mention the acting. Characters and relationships were made crystal clear. The singers are well known to us from other productions by Bare Opera, as well as from performances with other companies. They were all beyond excellent. The trickiest role was that of Rosina, performed by the superb soprano Liana Guberman, whose career has taken off since our first review. The role of Rosina in Il Barbiere is generally sung by a mezzo-soprano but the low register presented no problem for Ms. Guberman who was able to portray the spunky young Rosina as well as the rejected yet dignified Countess in Nozze. It always bothered us that Rossini and Mozart chose different fachs for the same character. But it didn't faze Ms. Guberman who sounds superb in whatever she tackles. No less impressive was the Susanna of Kristina Bachrach whom we hear often at the Brooklyn Art Song Society. It was a definite treat to see this splendid soprano in a new light. Her instrument is a beautiful one and she employs it effectively with fine color. Most importantly we believed her characterization and particularly enjoyed her "Deh vieni non tardar" in which she teases her jealous husband. One of the biggest surprises of the night was the Figaro of bass/baritone Paul La Rosa. His voice, his build, and his dramatic presentation are all muscular and, in our opinion, much better suited to opera than to lieder singing in which he tended to overwhelm the material. He is really a stage animal! He was very severe with Cherubino in his "Non più andrai". We felt his pain when he thought Susanna was cheating on him with the Count. Another surprise was the performance of Francisco Corredor in the role of Don Basilio. We know Mr. Corredor as a "character tenor" and always enjoy his comedic skills. But last night he was given the serenade "Ecco ridente in cielo" in which Almaviva, disguised as Lindoro, sings to Rosina in Il Barbiere. This was interpolated as a flashback to illustrate how the Count's affections had waned. Mr. Corredor sang it quite well. As Cherubino, mezzo-soprano Sophie Delphis was engaging. The scene in which Susanna and the Countess undress "him" was just a bit racier than usual and unusually well handled. We can think of no more delightful mezzo arias than "Non so piu" and "Voi che sapete". We wished we had an instant replay button! Bass Colin Whiteman made an excellent blustery Bartolo who softened at the end of the opera when he admitted that he loved Marcellina, a non-singing role taken by actor Paola Michelini, representing all servants everywhere. In Ms. Ligorio's telling of the tale, the entire issue of Figaro's origins was avoided and the reason Marcellina backed out of her resistance to Figaro's marriage to Susanna was that she didn't want to marry him, she wanted to marry Bartolo. If you are intensely devoted to the original story, this might have bothered you, but we were content to go along with all the plot changes and enjoyed ourself immensely. The scene that the audience seemed to enjoy the most was the ensemble from the end of Act I of Il Barbiere-- "Fredda ed immobile, come una statua"; In this case Bartolo was knocked out on the floor. The chamber orchestra was conducted by the renowned Sesto Quatrini, protégé of Fabio Luisi and now appointed Principal Conductor of Bare Opera, which makes us very happy. His arrangement for a dozen instruments worked exceptionally well with Music Director Laetitia Ruccolo at the piano and Victoria Wolf Lewis as Concertmaster. What impressed us was how well integrated was the music of Rossini and that of Mozart. The two operas were separated by 27 years with the Mozart premiering in 1786 and the Rossini in 1813. An audience member untutored in music would never have noticed any disjunction, so seamlessly was the music blended. The excellent titles were devised by Technical Director George Del Barrio and the costumes were designed by Raxann Chin--simple modern street attire adorned with jackets of the historical period. The action was staged in several areas of a large warehouse so that no set changes were needed. The audience was seated in two areas at right angles to each other so that sight lines were good. The orchestra was behind one of the seating areas which worked well. If you love Mozart, see it! If you love Rossini, see it! If you love a good time, see it!